Written by Melissa on Nov. 21, 2018 in Business. Last update on Nov. 21, 2018 . Written by Gregory on March 8, 2018 in Business, Retrospective. At the end of February we released "(I Fell in Love With) The Majesty of Colors" Remastered. Now that the furor and stress of the release week is behind us, we can look back at how it went. Last update on March 19, 2018 . "The Majesty of Colors" is Greenlit! Written by Melissa on Nov. 25, 2016 in Business. 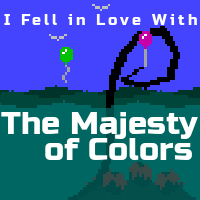 "(I Fell in Love With) The Majesty of Colors" has been greenlit on Steam! Thank you so much for your votes, your support, and for spreading the word. Last update on Nov. 29, 2016 . Written by Melissa , Gregory on Aug. 14, 2016 in News. In 2008, Gregory created "(I Fell in Love With) The Majesty of Colors", a game about love, loss, and balloons where you embody a sinuous creature from beneath the ocean who discovers the beauty and hazards of the surface world. Last update on Aug. 25, 2016 . Written by Melissa on June 25, 2016 in News. Last update on June 25, 2016 . Written by Melissa on Jan. 27, 2016 in Business, Retrospective. 2015 was a weird year. Somewhere in that year is a typical tale of an indie game studio underestimating project timelines and changing directions based on surprises and things they learned. But I want to talk about budgets. Last update on Jan. 27, 2016 . Written by Gregory on Dec. 19, 2015 in News, Releases. It's been a while since we've updated our morbid Discordian satire Ossuary, but there are some issues that have been nagging at us. We improved the introductory experience and made some additions and fixes to accessibility and usability. For full details, check out the update news. Last update on Dec. 19, 2015 . Written by Melissa on Nov. 28, 2015 in Development. Ossuary—which is currently 50% off on Steam, and will be 50% off next week on FireFlower—is getting an update soon to provide some user experience improvements. Last update on Nov. 28, 2015 . Written by Melissa on June 16, 2015 in Development. As indie devs, we leverage a variety of services to keep track of keys we've given out, press we contact or want to contact, vendors we've talked to, customers we've interacted with, and fellow developers/artists/etc. we follow. Highrise: a free-for-small-setups Customer Relationship Manager (CRM) in which we store customer, press, and vendor contacts and email discussions. Highrise was originally developed by the makers of Basecamp and Campfire, and still has that clean UX. Promoter: a free-for-tiny-setups system to track press mentions of your games. 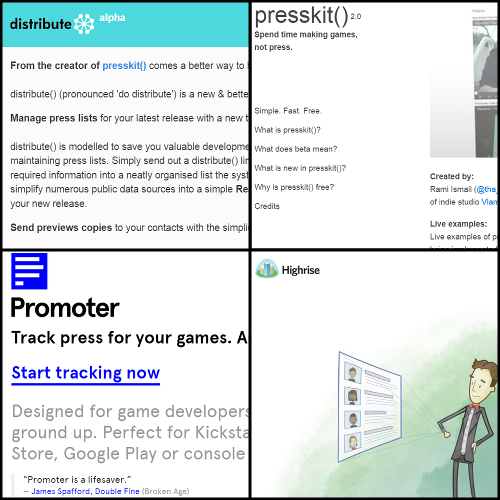 presskit(): a free, self-hosted PHP tool to create a presskit for your company and its games — descriptions, screenshots, videos, press quotes, awards, etc. distribute(): a free, centrally-hosted tool that houses game keys and provides an interface through which press can request them. Requests are vetted to ensure they aren't from randos, and shows the reach/audience size of the folks requesting keys. Last update on June 16, 2015 . Written by Gregory on May 27, 2015 in News, Releases. 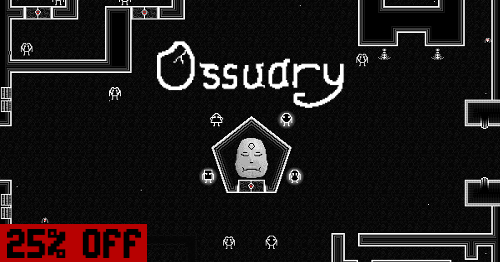 Our macabre Discordian adventure game Ossuary is now available on Steam! As part of its release, it's available for a limited time at 15% off, making it $8.49. Last update on May 27, 2015 .